1 O God, [be pleased] to deliver me, Jehovah, hasten to my help. 2 Shamed and put to the blush be the seekers after my soul! Turned back and dishonoured be they who delight in my calamity! 3 Let them turn back by reason of their shame who say, Oho! Oho! 4 Joyful and glad in Thee be all who seek Thee! And "God be magnified" may they ever say who love Thy salvation! 5 But as for me, I am afflicted and needy; O God, hasten to me: My help and my deliverer art Thou; Jehovah, delay not. This psalm is all but identical with the last verses of Psalm xl. 13-17. Some unimportant alterations have been made, principally in the Divine names; but the principle on which they have been made is not obvious. It is scarcely correct to say, with Delitzsch, that the psalm "has been transformed, so as to become Elohistic"; for though it twice replaces the name of Jehovah with that of God (vv. 1, 4), it makes the converse change in ver. 5, last clause, by reading Jehovah instead of "God," as in Psalm xl. Other changes are of little moment. The principal are in vv. 3 and 5. In the former the vehement wish that the psalmist's mockers may be paralysed with shame is softened down into a desire that they may be turned back. The two verbs are similar in sound, and the substitution may have been accidental, a slip of memory or a defect in hearing, or it may have been an artistic variation of the original. In ver. 5 a prayer that God will hasten to the psalmist's help takes the place of an expression of confidence that "Jehovah purposes [good]" to him, and again there is similarity of sound in the two words. This change is like the subtle alteration which a painter might make on his picture by taking out one spot of high light. The gleam of confidence is changed to a call of need, and the tone of the whole psalm is thereby made more plaintive. 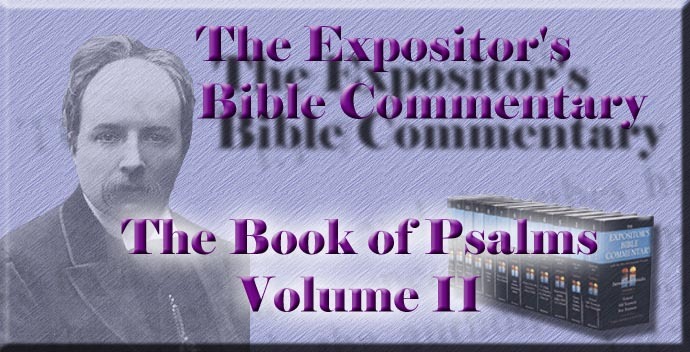 Hupfeld holds that this psalm is the original, and Psalm xl. a composite; but most commentators agree in regarding this as a fragment of that psalm. The cut has not been very cleanly made; for the necessary verb "be pleased" has been left behind, and the symmetry of ver. 1 is destroyed for want of it. The awkward incompleteness of this beginning witnesses that the psalm is a fragment. Italics show variations from Psalm xl.